Looking for a gorgeous nail polish shade to go with your jewel-toned Fall wardrobe? W Magazine recommends trying a rich, neutral brown this Fall. 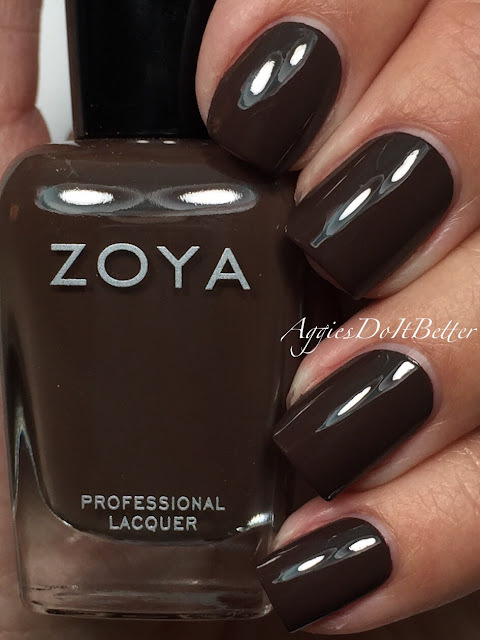 They love Zoya Nail Polish in Louise, a warm chocolate brown. Louise is perfect to up the “intensity” of your Fall beauty look and will match your Fall style perfectly. W Magazine recently featured Zoya in Louise in their article on their favorite Fall brown polishes! They love a chocolate brown polish to go with the colorful, jewel-toned styles of the season. Louise is best described as a rich chocolate cream. What is your favorite Fall neutral? Best Dark Nail Polishes That Aren’t Black! With winter in full swing, dark nail polish is a must for most people, but you don’t have to wear black to get in on the trend! Huffington Post featured Zoya in Emilia as a perfect choice for when you want to go dark, but not to the extreme. Emilia is a dark chocolate cream – and a simply delicious shade to go for this season. What are your favorite dark shades to indulge in? Share yours with us using #EverydayZoya! Zoya Chanelle was recently featured on Byrdie as a best non-toxic nail polish color for fall. Along with being a beautiful autumn color, Chanelle is Big5Free which means it is free of the 5 most harmful chemicals – Formaldehyde, Formaldehyde Resin, Toluene, DBP and Camphor. This toasted almond cream shade will be your new fall go-to. Fall is just about here which means it’s time to transition into dark and jewel-toned shades! Her Campus shared their list of fall’s hottest trends including chocolate brown. Their pick for the decadent shade is Zoya Nail Polish in Chanelle – a full-coverage, toasted almond cream. Will you be rocking chocolate colored nails? Share your mani with us using #EverydayZoya! Swatches of Zoya Desiree – See Her Here! Zoya Nail Polish in Desiree is a classic sable brown cream that has just enough gray to keep it cool in tone. Below are swatches of Zoya Desiree. We will be adding to this as more blogger swatches come in with a variety of skin tones! You can see more of Zoya Desiree on her Shade Spotlight as more swatches come in! Be sure to see the full Focus collection if you fell in love with Desiree! Swatches of Zoya Cinnamon – See Her Here! 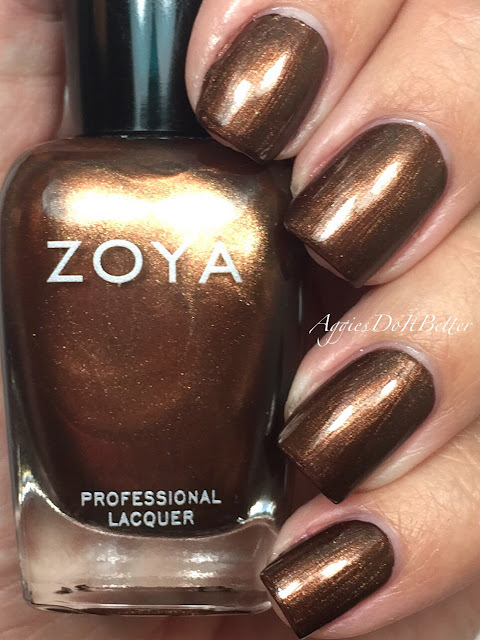 Zoya Nail Polish in Cinnamon is a classic bronze liquid metal, originally designed for Zang Toi NYFW Fall/Winter 2015. Below are swatches of Zoya Cinnamon. We will be adding to this as more blogger swatches come in with a variety of skin tones! You can see more of Zoya Cinnamon on her Shade Spotlight as more swatches come in! Be sure to see the full Flair collection if you fell in love with Cinnamon!